Apparently one of the numbers used by Tol (2009) to estimate the Economic Effects of Climate Change is incorrect. 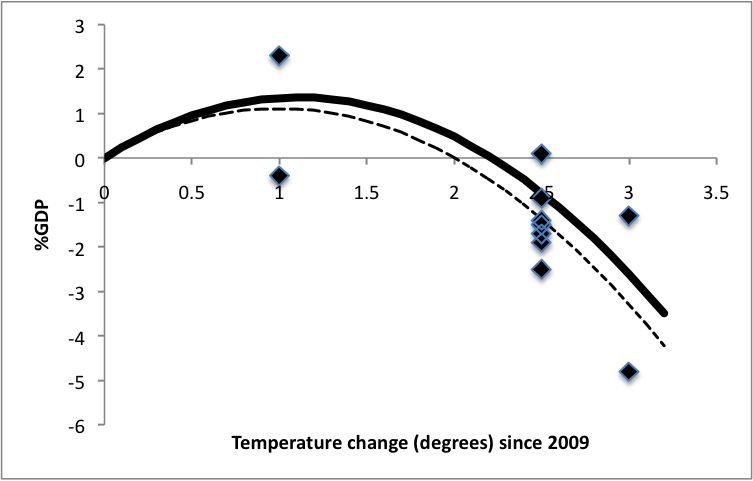 Chris Hope’s 2006 study actually predicted a -0.9 % change in GDP for a 2.5oC rise in temperature (since 2009) not 0.9 (as used in Tol 2009). I’ve done a quick test and as far as I can tell this reduces the temperature at which the % change in GDP will become negative, from 2.2oC to about 2oC (see Figure below – dashed line is my new estimate). I should acknowledge that it’s a Saturday morning, so I have done this quickly and rather crudely, so may have made a mistake. This error/typo in Tol (2009), presumably, also changes the year in which we would start to see the economic effects of climate change becoming negative. Based on the same assumptions as Matt Ridley seems to use, I get that this would happen in about 2065, rather than 2080. To be clear, I think this is heavily over-interpreting the work of Richard Tol anyway, but given that Matt Ridley has based his article on Richard Tol’s paper, and given that his paper has an acknowledged error (certainly Chris Hope has confirmed the error, as has Richard Tol I believe) this would seem to be an easy error to acknowledge and fix. If you want to read more about other issues with Matt Ridley’s article, I recommend articles by Chris Hope himself and by Bob Ward. This entry was posted in Climate change, Global warming and tagged Bob Ward, Chris Hope, Climate change, GDP, Global warming, Matt Ridley, Richard Tol. Bookmark the permalink. Now add the confidence intervals. I did consider that, but since Matt Ridley seems to have ignored them I thought this would be suitable for a Saturday morning. That’s not really the point though, right? There’s a typo in your paper that changes the result and hence, one might think, should be corrected. You can’t get away with arguing that you don’t need to correct your work because I haven’t added confidence intervals to my quick calculation (this is a blog post, not a peer-reviewed paper) – or is that what you’re actually suggesting? Come on Wotts, of course Tol is distracting from your point. It’s what he does now. He’s got no integrity. That is certainly how it appears. Of course, the more direct questions he avoids answering, the more obvious it will become. Surely the evasion in the last post was more than adequate as an obvious demonstration of facile agility? Happily it’s withing the power of anybody to instantly improve, once they’ve been shown their error. The choice of whether to do so lies between only a single pair of ears. You can get a rough estimate of the confidence curve lines by comparing with the graph in Tol’s paper. A not insignificant possibility of the effect on GDP not being positive for any temperature rise! In the following discussion, there’s a guest appearance from your favourite tweeter, Wotts. With Richard Tol always so quick to make claims about papers being wrong, I expected him to correct the scientific record (i.e., his paper). I have so many favourite tweeters, it took me a while to work out which one you mean. Yes, that was my thought. Possibly Richard feels that his paper is peer-reviewed (and hence right) while my blog post was thrown together quickly on a Saturday morning (and is hence wrong). Until I publish this (with confidence intervals) he need not do anything. I have the impression his peers might be a rather ingrown little group. Lately it’s become clear that respected economists, including Nobel Prize winners, are able to run off the rails with respect to macro policy, refusing to adjust to new data. Could that be true here as well? It might be a useful exercise to get under the hood of Tol’s modeling assumptions and see if he’s managed to stay up to date. That 2002 results still seem to be part of the current discussion doesn’t give me a lot of confidence in that. I’m not sure the analogy with macroeconomics policy is a good fit; the principles being disagreed in the macroecon policy sphere seem fairly static compared to the present case. But Steve seems spot-on in his point about the short shelf life of model underpinnings. Anybody would be challenged to build a model and make projections based on that model, if the assumptions underlying the model were themselves a moving target. In this case of anthropogenic global warming, economists must work with what physicists and other disciplines are able to offer and in turn that picture is substantially changing as the underlying science of the matter is resolved with better acuity. It doesn’t seem a case where the foundations of the modeling structure is sufficiently reliable as to allow much confidence in projections, or not without constant revisiting of lower layers of models. This conversation could take a distinctly positive and enlightening track if an economist here took the opportunity to discuss how this matter is addressed. Steve offers a good case history to look at. The positive aspect of the curve are largely benefits to ag in northern high latitudes. My view is that on balance current impacts are probably economically negative. If they were positive, there would have to be a temperature and CO2 signal in ag production. However because tech has been driving production, which has now flattened out in many places, quantifying that would be extremely difficult. I suspect you may be correct. Even in the paper, Richard Tol comments on how the benefits likely accrue in the regions where there is most economic activity (northern medium/high latitudes predominantly), so there doesn’t seem to be much debate that some areas will see significant negatives. It does seem remarkable that some seem comfortable with the idea that we can continue to benefit despite us being the mainly drivers of climate change and despite those who contributed least to climate change, likely suffering most. Paul Krugman reviews the new book by William Nordhaus, the originator of the climate economics field. I had quite forgotten that Krugman’s very first economics gig was as Nordhaus’ research assistant. There may be some pertinent material in both (can’t see beyond the first bit of the review without a subscription). Ehm, this actually *explains* why “we” are comfortable with it: it’s benefitting “us”! Saying “some increase in ag benefits due to warmer climate in high latitudes” is easy; on the whole, plant productivity will increase with slightly warmer and longer growing seasons, and yes, some increase of production due to increasing CO2 concentration. But this ignores several other factors which influence productivity, primarily soil fertility and moisture availability. I don’t know if we can predict how systemic changes in weather patterns will affect rainfall and humidity in an agricultural region, but we do know that, for example, soils in the Boreal Forest are not going to be as productive as prairie soils which have been converted to farmland. I live in Alberta, which has some very productive grain-growing regions due to our long Summer days, and in spite of shorter growing seasons compared to US prairie regions. On the other hand, the southern third of the province is marginal in terms of moisture availability, and we’ve had droughts in the northern regions in the last 25 years. To say that somehow we’re going to become the equivalent of Kansas as a grain producer is speculation based on little knowledge. It’s just as likely that we get less rainfall with increasing temperatures. The other speculation I’ve heard quite often is something like, “Once the Pine Beetles get through with the Boreal Forests, we’ll just move in and plant corn in that vast area – therefore, there will be a net increase in growing acreage” = Win! This outcome seems very unlikely, as the typical Boreal Forest soils are poorly drained, acidic, and low in nitrogen for starters. And that’s before we even start talking about melting permafrost and continent-wide weather patterns changes. We’re betting our mostly adequate and reliable (depending where you live) agricultural productivity against a very large set of unknowns. If you search Nordhaus on the New York Review of Books site you can follow the actions of a battle conducted in the form of articles and replies between Nordhaus and a small unit of the larger soiled army of usual suspects. Happer, Lindzen & Cohen form a yapping pack against one, as usual; SOP is to cut out a single target and attack en masse, liberally spray with Gish Gallop. Classy. Krugman;s review is now open access.